Anselmo Garcia was watching over his 1-year-old daughter and 10-year-old son Saturday evening when he heard a “really hard knock” on his front door. He opened the door. He can’t remember who was there. All he heard was that his wife, Alma Vasquez, his 6-year-old son, Angel, and his 20-year-old brother, Jeymi, had been involved in a tragic accident. On Monday, Oakland police identified the man suspected in the hit-and-run Saturday night that killed the mother and son and critically injured Jeymi Garcia. Rasenoch Allen, 27, was driving a black, two-door Mercedes that hit the three, police said. He was allegedly heading west on Foothill Boulevard around 7:15 p.m. when his car smashed into the family in the crosswalk at 26th Avenue. Vasquez and her family had just finished doing their wash at Family Laundry near 26th Avenue and Foothill Boulevard. 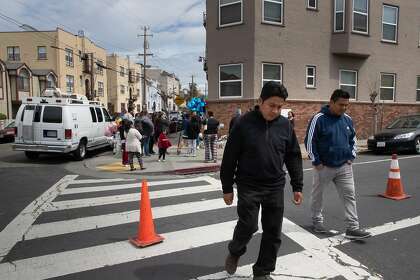 They were crossing the street to return home when the crash happened, Garcia said. Benita Jueres, 47, works at the laundromat and said the Garcias were like family. She met with Alma Vasquez at least once a week for meals and had hosted a baby shower when Alma Vasquez was pregnant with Angel. Jueres, who lives near the laundromat, said she ran out to the intersection when she heard about the crash. By the time she got there, a blanket had been placed over Angel’s body and emergency responders were giving CPR to Alma Vasquez and Jaime Garcia. Jeymi Garcia had recently moved into the country and was a student at Fremont High School. Angel was a student at Oakland International Community School. “Everyone in OUSD is devastated to learn of this tremendous loss at International Community School,” said Superintendent Kyla Johnson-Trammell. “As a district we implore whoever did this to come forward and take responsibility for the lives they shattered. And we urge all drivers to take great care — and slow down! — when behind the wheel. Our children’s lives depend on it,” she added. Principal Eleanor Alderman organized a Go Fund Me for the family. The Garcia family isn’t a stranger to tragedy, Alderman added. Several years ago, the family lost their home in a fire. On Monday, Garcia joined dozens of neighbors and friends outside the laundromat. A makeshift memorial had been set up near the intersection with flowers, candles and photos of Angel doing art at school and smiling as he sat in water at Crab Cove during a school trip. Councilmember Noel Gallo, whose district includes the intersection, responded to angry residents in the area calling for more traffic enforcement. As they spoke, a driver whizzed past them, angering many of the people who had gathered outside the laundromat. Gallo said he was going to direct a police captain to send eight motorcycle officers to enforce traffic laws at the intersection. He is also going to allocate $70,000 from his office’s budget to install a yellow, flashing traffic light at the intersection. Gabriel Garcia, Angel’s 10-year-old brother, stood nearby with tears in his eyes. Gallo patted his head and promised to help his family. 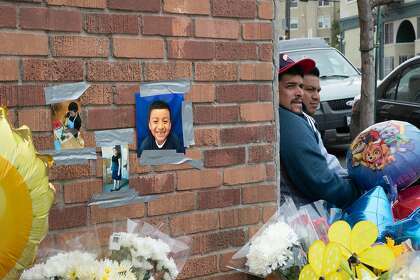 “We are never going to forget your mom and your brother,” Gallo told the boy, who nodded. Vasquez, 30, and Angel were taken to local hospitals, where they died from their injuries. The 20-year-old man, Garcia’s uncle, remains in critical condition. All three victims are Oakland residents. A march will be held at 3 p.m. Thursday from the International Community School to the intersection of 26th Avenue and Foothill Boulevard to demand change and better traffic enforcement. Allen fled the scene and authorities recovered the vehicle after he abandoned it in another part of the city, police said. Officials have not determined if alcohol was a factor in the crash. The 27-year-old suspect was previously arrested for attempted armed robbery in Humboldt County in 2018 and a fatal shooting in Oakland in 2016, according to authorities and court records. Allen was previously arrested on July 3, 2018, in Humboldt County on charges for attempted robbery, conspiracy to commit a crime and carrying a loaded firearm in a public place, said Samantha Karges, a spokeswoman for the county’s Sheriff’s Office. He was freed after posting bail of $50,000 and pleaded not guilty. He is due back in court on May 21 for a hearing, according to the Humboldt County district attorney’s office. The Humboldt County Sheriff’s Office said a male victim called 911 at about 3:30 a.m. July 3 and reported three masked men fleeing toward a white cargo van parked just east of his driveway. One of the men pointed his firearm at the male victim, who was sitting inside his car, in the driveway. No items were reported stolen from his residence. The men fled in the van. Authorities found Allen and three other men several hours later asleep in the van. The men were immediately arrested. During a search of the vehicle, deputies found two firearms, one of which was loaded, a loaded high-capacity magazine and burglary materials, the Sheriff’s Office said. In 2016, Allen was arrested in Oakland on murder charges, according to court records. He pleaded not guilty. His charges were lessened to accessory after the fact in 2018 to which he pleaded no contest. Allen was sentenced to three years in prison and was released shortly after due to time already served, court records show. Police are offering a reward up to $25,000 for information leading to Allen’s arrest. Anyone with information about the incident can call the Police Department’s Traffic Investigation Unit at 510-777-8540 or the Crime Stoppers of Oakland at 510-777-8572. Has Prince Harry Introduced Meghan Markle to Princess Diana’s Family?